ETA Eddy Popescu, from Great Britain, during his performance at the Flaming Star Festival, 2017. Photo Credit: Lori-Anne Crewe, LA Crewe Photography, for SIDEBURNS Magazine. 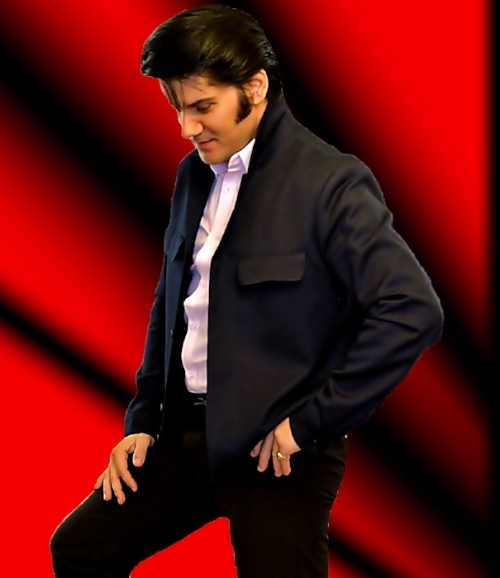 Since I first met ETA Eddy Popescu last October at the Flaming Star Elvis Festival, and subsequently posted his bio on SIDEBURNS, Eddy’s star has risen exponentially in Great Britain and on the international scene since his days of busking on the streets of Newcastle. One needs only to check Eddy’s upcoming bookings on his Facebook page to see how far- reaching the popularity of the handsome, young, talented, Romanian born entertainer has become. Performing in sold out venues abroad, we are all very happy that Eddy is taking time from his busy schedule to return to Canada for a second visit when he competes at the Collingwood Elvis Festival on the weekend of July 27th to 29th, 2018. I wish to thank Eddy for answering my interview questions and for allowing SIDEBURNS Magazine followers to get to know him a little more personally. Thank you also to Natalie Lacasse for contacting me about a follow-up interview. It was my pleasure to answer Natalie’s request, as I truly enjoyed posting ETA Eddy Popescu earlier bio, and was equally happy to edit and prepare Eddy’s interview for all to enjoy. I wish you safe travel, Eddy, and great success at the Collingwood Elvis Festival. Best regards, Carolyn MacArthur. Q. In what city and country were you born? A. I was born in Constanta, Romania. Q. Have you lived in any other countries? A. I lived only in Romania, but I moved to England in 2010. Q. In what city and country do you now reside? A. I live in Newcastle upon Tyne in England. A. Not much about my childhood was special, to be honest. I had only one dream since I saw a movie with Elvis when I was 6--to be a singer like him . A. While still young, I loved my free time, enjoying the hot summers. I wasn’t in a hurry for a job or so. A. After high school, the time to look for a job came. I remember my first job was at McDonalds. :) It wasn't for me though. After this I had a small business with computer games. ETA Eddy Popescu looking fantastic in his '68 Comeback leather outfit. Photo provided by Eddy Popescu. A. I didn't have the chance to take any lessons related to the performing arts. When I opened my business with computers, I had access to the internet for the first time (I am talking about some good years back when access to internet wasn't like it is today). So with access to the internet, I started looking for more and more information about Elvis, and searching for all his music, movies, backing tracks etc. I started to practice at home singing and learning the songs, never knowing that one day I would be on stage doing Elvis tribute shows. I just loved it, but being on stage was just a dream at that time. A. My parents both loved music. My mom use to sing when she was young; but when she got married, she quit. My father loved poetry and music. I heard music of all kinds, including Elvis, but only a few songs. Q. Were you a performer prior to becoming an ETA? So, I went on stage and sang “Love me Tender.” :) That's the way I started singing in Romania. Because this man saw something in me and believed in me, I owe him so much. His name is Adrian Irimia. We performed the year after in restaurants, hotels, weddings and parties. At that time I used to sing all kind of songs from different artists, and not only Elvis. But I always had a good response from the audiences for the Elvis Songs. Mamaia is a place to spend your summer holidays in Romania. I lived only few miles away from this amazing place. Mamaia can be compared with Benidorm or Blackpool, and maybe even Florida. It is a beautiful place. All the artists go there the sing in all the places for the whole summer. A. I loved Elvis since I was a kid and as I said, being on stage was just dream. But I guess it was meant to be, and the time to do this came. I moved to UK in 2010. It was here where I heard, for the first time, about Elvis tribute artists, Elvis festivals, competitions etc. When I moved to UK, I had to sing on the streets. This is the way I started...performing on the streets in Newcastle. I had incredible support from the people who stopped by to listen to what I was singing. It wasn't easy, but life has ups and downs. After a few months I started to work with some local entertainment agencies. In 2012, I was awarded the Best Newcomer in North East UK award. Because in my shows I was singing Elvis songs, people called me Eddy Elvis. In the late 2013 I had a manager, who found me and wanted to work with me; so we created the Elvis Show together, and we had success. A. I was nervous. I had already success with my regular shows, but not as Elvis. But I remember the first Elvis full show I had; I like to think it was a success, but was it? :) I don't know. I hope so. No! After a few years of doing this, I say I still have so much to learn. A. When it's about a competition, it's hard. I don’t like it. You can feel tense, and it can be very stressful. But I can't say it's the same all the time. Sometimes, I am more relaxed; but sometimes no matter how much I try to be relaxed, I just can't. I am nervous when I do new venues in front of new crowds. I want them to be happy, and I want to deliver a good show . A. 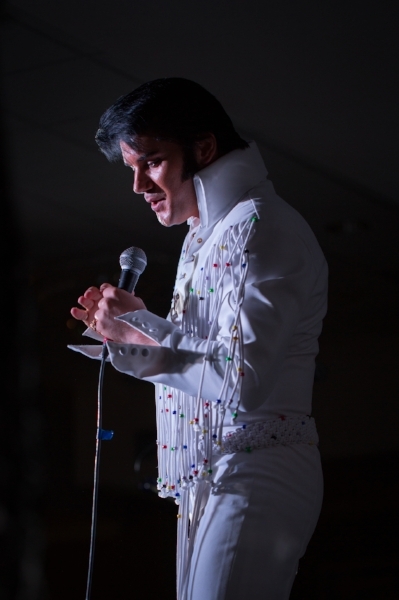 The European Elvis Championship in Birmingham, 2014, was my first competition ever. And I had been doing Elvis shows for only a few months. I remember when I saw all those guys so well dressed and so good looking with BK ENTERPRISES jumpsuits, it made feel so bad as I was wearing a £100 jumpsuit made by somebody. :) But I won the Gospel Contest! I had a great, great feeling afterwards. I was so happy. It made me feel more confident about it and encouraged me to work harder. A. Honestly, and keep in mind this is only my opinion :), the young ETAs imitate other ETAs, but not Elvis. There are a few more mistakes, but I think this one is quite important. ETA Eddy Popescu. Photo provided by Eddy Popescu. A. I have learned so many things from my parents, from their advice, and even from their mistakes or my mistakes. Life is the best teacher you can have. I know one thing for sure: LOVE IS THE KEY THAT CAN OPEN ANY LOCKED DOOR. Hate is not an option; love is. Be good. Be honest. Be kind and humble…too much to talk about this . Q. Do you have tattoos? Explain their importance to you. If you don’t have any tattoos, what would you chose as a design if you were going to have one (or more than one)? Why? The 2014 Competition in Birmingham is the most important to me, as it was my first competition ever as Elvis Tribute Artist. Flaming Star Festival is also important to me, because it was my first visit and first competition ever in Canada, and loved it so much. A. I think as an ETA, you can a have, and feel, a little bit of what Elvis was. I even think of this while I am on stage having a success, this thought is coming to my mind. It is a good feeling. Elvis said it's about giving and receiving. I think this is what it is all about. You give what the audience wants, and you receive at the same time. As an artist performing on stage, I should think about to doing your best for them. And again, being an ETA, I am always seeing new places, travelling, having fun, and making new friends all over the world. The biggest family in the world is THE ELVIS FAMILY. A. My mom and my wife. A. A sad face makes me sad. Every person on this earth should be happy, smiling, having fun, and be free to travel and see the world, enjoying life. All our life is about money and bills. Some people are lucky, some people are not. Some of the people have too much; some of the people have nothing. The contrast is so high. Again here is too much to say; it is a deep subject. It makes me sad to see so much hate in this world, conflicts between brothers and sisters, children and parents , men and wives ….something is wrong , that's for sure. A. I have been performing in Edinburgh, Scotland, Benidorm, Spain, Maloy, Norway, and Denmark. The audience is the same I would say. If they coming to see an Elvis Show, it is for sure you will have Elvis fans in the audience; so it is the same good response. They always have a good time when it's about Elvis . Q. What were your first impressions of Canada and Canadians? A. I love Canada. Although I was there only for few days, I just had a feeling like being home. It is a nice feeling. I have been in many countries before, but I didn't have the same feeling like being home. I had the same feeling about England when I moved here in 2010. Canadian people are so very friendly--I really love them. A. I love my free time. I don't go out much. I like being home, relaxing, listening to music, playing guitar or practicing some new songs, or watching a good movie and spending time with my family . Promotional photo of ETA Eddy Popescu provided by E. Popescu. A. I don't know. If it were possible just to be around him and know him as a person, the real man Elvis . A. I don't know. I have a passion for photography, so maybe in the future I will do photography. At the moment, I don't have time for it . A. I just came back from the Blackpool Elvis Celebration Festival, and in the audience there was a little girl--my biggest fan--she is in love with me. She tells everyone that she will marry me, and the best man will be Mr. Juan Lozano :) (a good friend of mine, and a superb ETA). A. I had no Christmas time with my family in the past few years, being on stage all the time, and December being such a busy month. My son always complained about it. Being an ETA can be very expensive too. The PA system , the vintage microphones, costumes from 50s to 70s, jumpsuits etc. are a lot of money. A. The peacock jumpsuit. Why? I just love it. A. I don't use make up; I am quite natural . A. Nothing special, I use any kind of shampoo. I dye my hair black from time to time, as my natural color is brown. ETA Eddy Popescu during his award winning performance at Flaming Star Elvis Festival, 2017. Photo Credit: Lori-Anne Crewe, LA Crewe Photography for SIDEBURNS Magazine. A. Well…what I can say is all I want is to be well and to have a happy family . That's all I need. A. We all have disappointments--that's for sure. I take the time to think of it, learn from it, understand it, and be grateful. :) It's good to speak about it with someone, but I am not a person to speak about it . A. My family first of all, and all the people from UK, especially from Newcastle who showed me so much support since I moved to UK busking on the streets in Newcastle. I owe them so much. I will never forget their support. Love them so much x. A. That fame and fortune will never change me. I.ve been up and down, poor and rich, but I stayed the same, a simple and humble man. A. The band and the backup singers always make me feel comfortable and give me confidence; so I always say thank you before and after, as they are doing such a great job.